Something fresh this morning thanks to a heads up by our friendly remixer Aaron is Coppersky's Amiga music disk ' Coppersky Musicdisc ' which was released late yesterday. Unlike the usual scene demo tunes this one has many tracks converted over from some of the other popular systems of their time such as the MSX and the X68000. 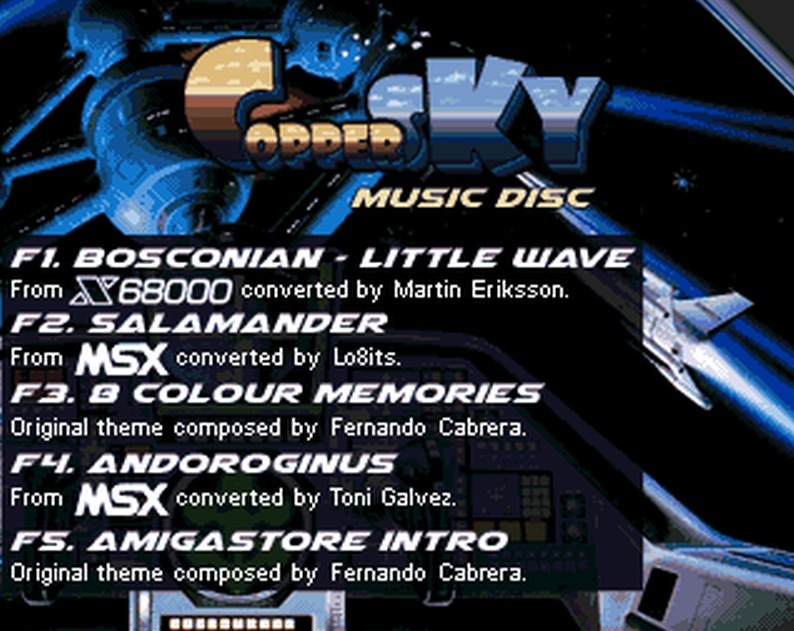 Tunes such as Bosconian - Little Wave from the X68000 converted by Martin Eriksson, Salamander from the MSX by Lo8its, and Andoroginus converted over from the MSX by Toni Galvez. If the MSX is not to your fancy there is also 8 colour memories by Fernando Cabrera and Amigastore Intro composed by again, Fernando Cabrera. It's not the biggest amount of tunes we've seen but it does give you a reason to turn the old girl back on again!